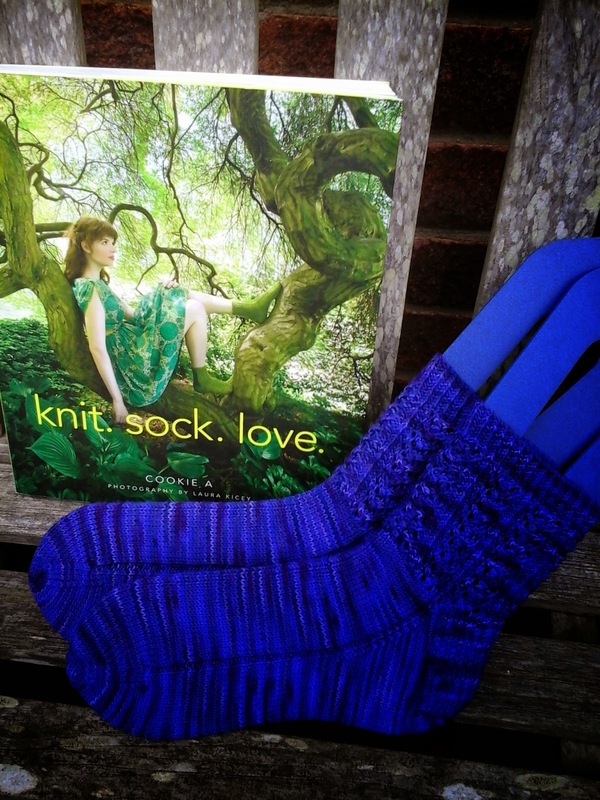 Me, My Socks and Pie: Hedera Socks - Look what was in my WIP's basket! So my plans to do lots of knitting this year are coming along well. Plus I am working though my WIP's projects (work in progress), that have been hanging around for far too long. Obviously I'm not finishing things just for the sake of it. That would be a terrible waste of yarn! However, sometimes things jump out of the WIP's basket and shout 'finish me'. 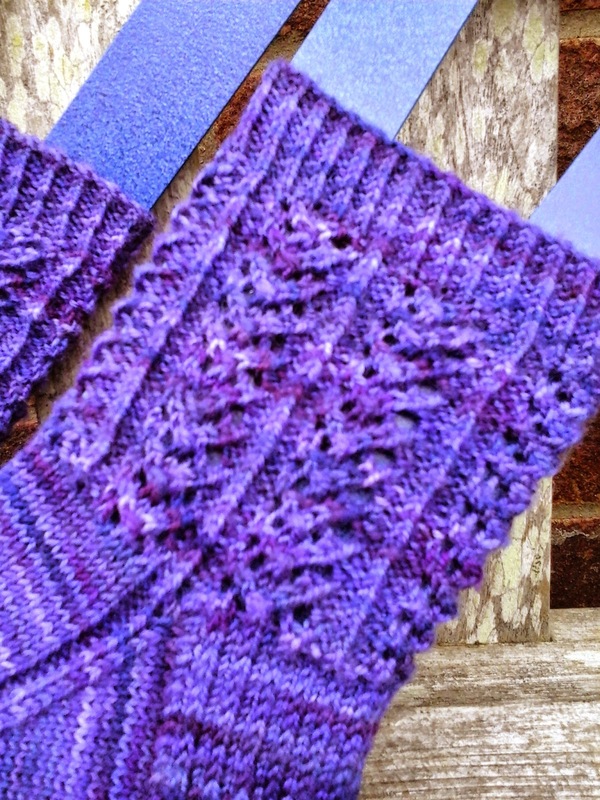 I started a lovely sock pattern called Hedera by Cookie A, back in November 2013. But for whatever reason, I started another pair of socks and the Hedera's languished in the pile. 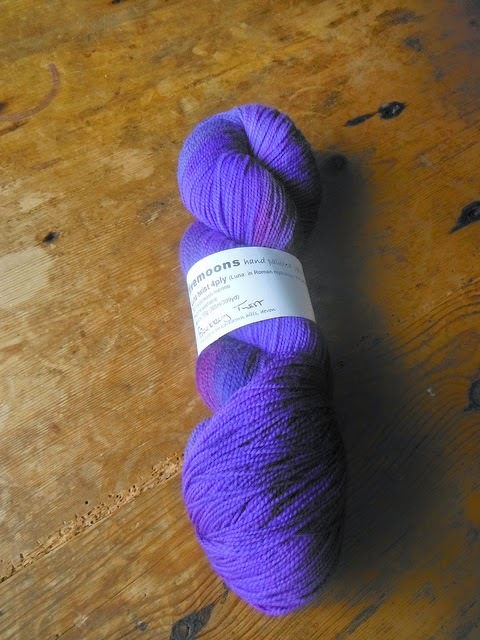 Such a shame, as I was using gorgeous high twist yarn by Five Moons in the Blackberry Twist colourway. 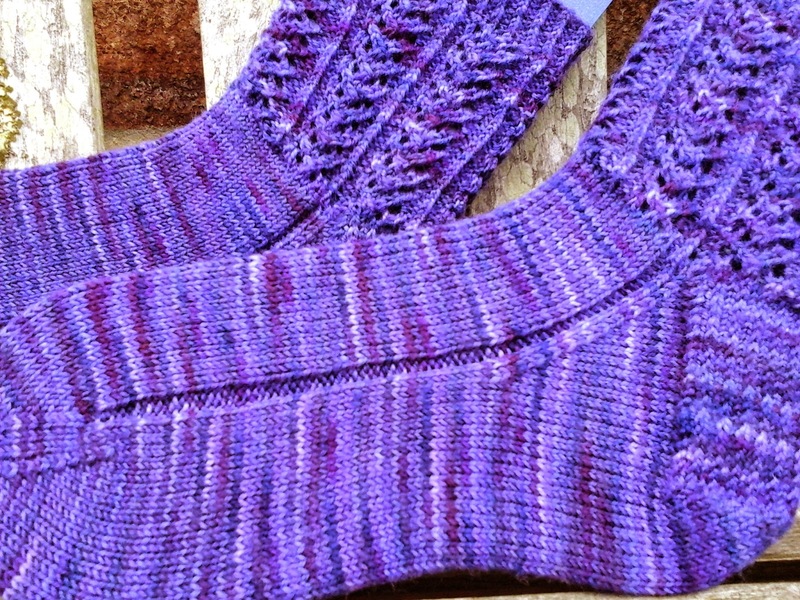 When I started the socks back in 2013, I knit about 2" of the first sock and that was it. I used 2.25mm needles and cast on 60 stitches. My usual number for socks, but normally on 2.5mm needles. Just a 1/4mm makes such a difference to the gauge and as I was knitting them, I realised they would be a bit snug. Cue a well timed comment from my Mum with little feet, when she heard I was back sock knitting with a vengeance. 'Well, I could certainly do with a new pair of hand knit socks'. Subtle she is not! Well yesterday was her birthday and purple is her favourite colour, so I think it all came together quite well. I managed to get them finished a couple of days before I went up for a visit. Phwew! And they fit! I love to knit and I love knitting socks. Quite an apt book for me to knit from then really. The pattern should follow down the top of the foot, but I wanted a smooth foot (except the purl, purl, ktbl detail along each side). Plus it shows off the yarn better I feel. The yarn gave really good stitch definition. All in all, a joy to knit and a pleasure to gift. My Ariel Bias scarf is coming along a treat, especially as I knit some rows in the traffic jam going up north and I've decided on a new sock challenge. Knitting two-at-a-time. I must be mad!